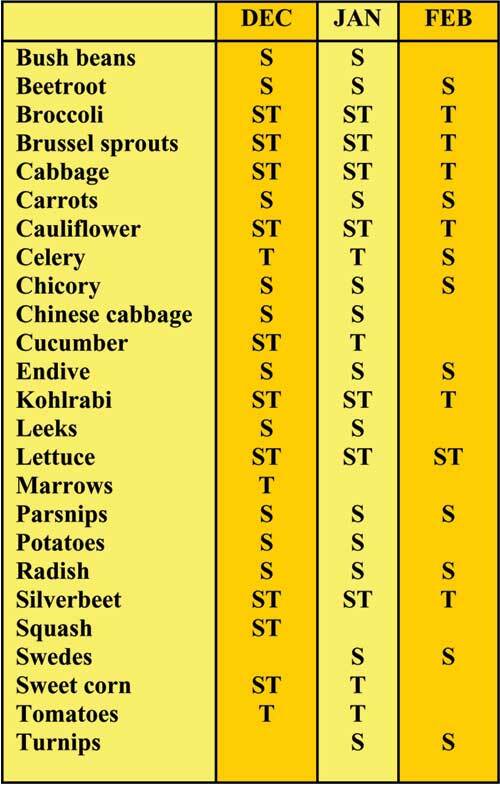 This table is a guide only – observe the seasonal weather patterns before deciding when to plant, as there will often be distinct differences in summer weather from one year to the next. Planting times will vary for different varieties of the one vegetable eg December plantings of heading lettuce varieties should be successful; while February plantings should be the butterhead varieties. In summer it is a good idea to mulch your garden beds to help keep the soil cool and moist. One experiment showed that a 4cm layer of straw reduced evaporation by 73%. Be careful not to lay down a thick layer of sawdust or lawn clippings that can pack down to form an impenetrable barrier to water. Soil with lots of compost contains all the nutrients your plants need for strong, healthy growth. In addition well composted soil retains water and act like a sponge to keep your plants moist through dry summer days. On days of extreme temperature your plants may need to be physically protected from the heat. This can be achieved by covering plants with shade cloth secured on a frame eg weldmesh or irrigation pipe bent over to form a tunnel, with shade cloth secured by pegs) making sure that there is no way that wildlife can be trapped or snagged. Try not to water the leaves of plants that are susceptible to fungal diseases (eg tomatoes, cucumbers, pumpkins and zucchinis) and try to water individual plants thoroughly, rather than watering a whole area. Always follow water restrictions and check soil moisture before watering—a rostered watering day doesn’t mean you must water. Keep weeds down. They compete with your plants for food, water and sunlight. It is best to tackle them when they are small—before removing them becomes an exhausting exercise.